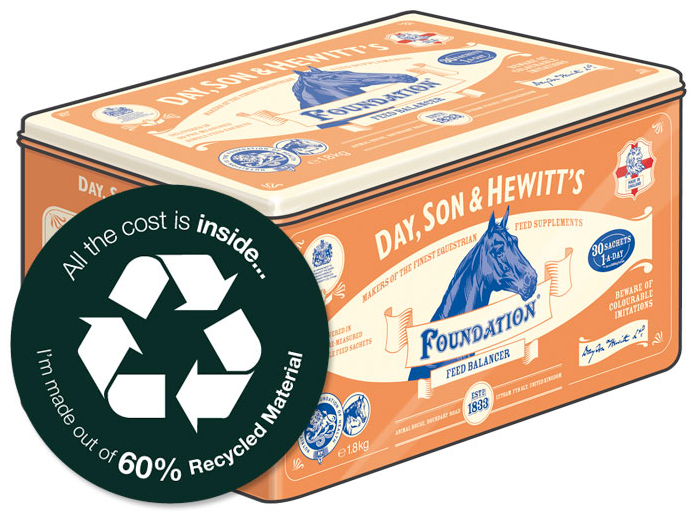 Foundation is a broad spectrum multi- vitamin and mineral supplement designed to balance the diet of all classes of horses and ponies. A balanced diet is essential for health and performance and the basis of this diet should be good quality fibrous forage, as this is what a horses digestive system has evolved to deal with. However, in many areas of the UK, forage is deficient in essential minerals and nutrients and even in non-deficient areas, its quality can vary tremendously. In addition to deficiencies suffered as a result of poor quality forage, horses which are fed less than the full recommended amount of compound feed are also likely to be short of essential nutrients. Therefore, in both these situations, it is essential to supplement the horses diet with a high-quality forage balancer such as Foundation®. If a horse is receiving a balanced diet, they will be healthy and maintain condition. Fed alongside good quality forage, Foundation® will eliminate the requirement for compound feed for horses at rest, in light work or those that hold weight easily. Below are some recent questions we've received regarding Day Son & Hewitt Foundation, including answers from our team. Do the sachets come in the aluminium tin as pictured or are they sold on their own? Yes the sachets come in the tin shown on the product listing's picture.